Join us between 8:30am and 1:00pm on the dates below for fresh cooked breakfast with friends. Cost is $6.00 per person for members, $8.00 per person for non-members. 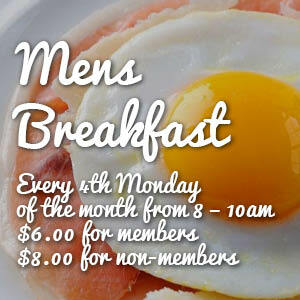 On the 4th Monday of the month there is a men’s breakfast. Check the calendar for any updates, as the kitchen ocassionally has private rentals, which can affect the date of this breakfast. Thanks! !